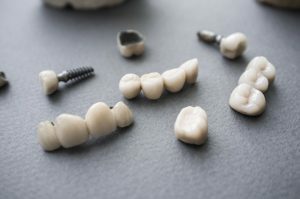 Dental crowns are fixed prosthetics that are cemented to existing teeth or connected to implants via an abutment. Their main purpose is to cover and protect natural teeth that were damaged either from decay or a dental injury. This prevents the tooth from fracturing further as well as block bacteria from reaching the vulnerable pulp where tissue and nerves lie. Bacteria that reaches this area can cause an infection, so it’s essential that you get a crown if it’s recommended by a dentist. Crowns are also ideal when a filling has become too large to sufficiently protect a tooth or a tooth has recently undergone root canal treatment. However, crowns aren’t only for restoring or protecting existing teeth. Dental bridges take the concept of dental crowns and expand their versatility even further. A bridge consists of three dental prosthetics and are mainly intended to replace one or multiple missing teeth. To do this, a dental crown has two other crowns attached on either side. In order to create room for the bridge, the dentist removes a very small amount of existing tooth enamel, allowing the crowns on either side to fit on top of your teeth. In this case, the center tooth acts as the replacement and effectively bridges the gap in your smile. If you want to replace teeth in this way but create a stronger foundation, bridges can also be supported with dental implants. This option is also ideal if you intend on replacing multiple teeth at a time. When choosing a restoration, you’ll need to take your dentist’s advice and consider which teeth you are replacing. You’ll also need to consider the extent of the damage currently in your mouth. For example, if you have a large cavity or are pursuing root canal treatment, a dental crown will be necessary. If the damage isn’t as extensive, a filling may be enough. If you intend on replacing an entire tooth, you’ll need a bridge to prevent overeruption from occurring. When teeth are missing, other teeth begin to shift into the empty space. This will cause your bite to change and may cause complications later in life. Have more questions about the process of receiving restorations? Schedule an appointment with your dentist in Ripon today! Dr. Christopher J. Johnson earned his DDS degree from the Marquette University School of Dentistry. He’s trained with some of the world’s most well-known teachers, particularly in cosmetic and complex restorative dentistry. To learn more about his practice, you can contact him through his website.